This section can be accessed from the Document Viewer>Doc Tab. Files can either be redacted directly in Lexbe eDiscovery Platform or you can upload documents already redacted to you cases. This version requires that you redact your document locally (on your computer) using a local program. NOTE: Please note that if redacted document version of the same file already exists, uploading a new redacted PDF will overwrite existing redacted document. For more details please follow our instructions here. >the PDF file to your local desktop. (File download within the Doc tab). >Once the upload is completed the 'Redacted' tab will display its version in the Document Viewer page, while you can still view the underacted version from the Page, Doc and Original tabs. >From the Document Viewer>Redacted tab, you can download the 'Redacted' version outside of a production within the embedded viewer using Acrobat controls icons (move your mouse cursor down to the bottom of the page- in the center). >Please also note that Browse and Search pages do NOT download the Document or Original file if there is a redacted document available. Only the redacted version is downloaded from those pages. The hyperlink 'Download' located in the upper right hand corner of the Document Viewer will download both versions of the original file (Originals, Doc (full PDF) and Redacted). Only the redacted versions will be automatically included into the productions under the ''ORIGINALS', 'PDF' and 'TEXT' sub-folders. 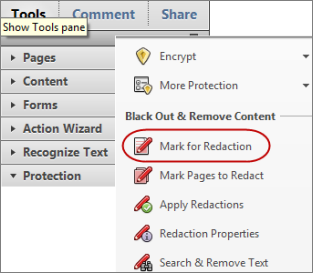 >Redact the PDF file using a PDF editor with redaction capabilities (e.g., Acrobat Pro, Nitro Pro, Auto-Redact Plug-in for Acrobat, etc. ), or other PDF redacting tools. With all tools, be sure to use redaction tools and not drawing tools, as drawing tools will not remove text layers. >You should also make sure that your redaction tool has removed the text layer as well as the image view of the redacted text. You can check this several ways, including copying out the text from 'Save As Text' option in Acrobat Reader'. You can also search for redacted text if your redacted copy has been OCRed (best practice is to save as an image with your PDF editor to remove all text possibilities). 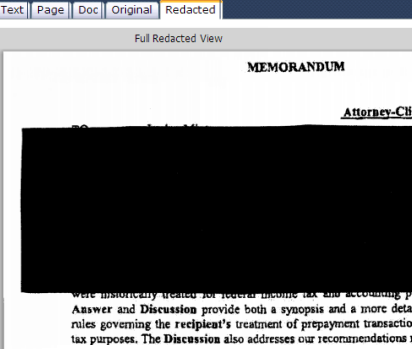 >Make sure that the number of document pages are the same (redact rather than remove pages, if needed). To maintain Bates numbering consistency, only redacted PDFs with the same number of pages as the unredacted PDFs can be uploaded. >Make sure your redacted PDF is not corrupt, password protected, print restricted, extraction restricted, etc. (Check properties in file within local PDF viewer). >We suggest that you name the redacted version with same original file name, except adding '-RED' to end of the title (e.g. Enron 00012345-RED). You can also redact files directly in Lexbe eDiscovery Platform by choosing the 'Open Redaction Editor' button. For more details please follow our instructions here.